In a small saucepan, bring the water, strawberries, and sugar to a boil. Turn down the heat and simmer for about 10 minutes, until the strawberries have released their juices and softened, stirring periodically. Remove from heat and allow to cool slightly. Carefully strain the syrup to remove the softened strawberries. I set a colander over a bowl and pour the strawberry syrup through the colander, pressing the strawberries against the sides of the colander with a spatula. Discard the strawberries, or save them for another use, such as topping on waffles. You should have just over 1/4 cup of strawberry syrup. In a large bowl, combine glutinous rice flour, water and the strawberry syrup with a fork. The mixture will be very dry and chalky. Using your hands, make 2 small balls (about 1 tablespoon each) by squeezing the mixture tightly together with your palms and fingers. Bring a pot of water to a boil, and cook the 2 balls for about 5 minutes, until they are floating and slightly swelled up. Remove the cooked balls and add them back into the bowl, along with the oil. When it is cool enough for you to handle, using your hands, mix everything together. The dough should start to come together. At that point, transfer the dough onto the countertop and knead everything together for at least 5 min. At this point, the dough should be very smooth, slightly sticky, and easy to handle, with no clumps at all. If the dough seems tough and cracks after kneading for 5 minutes, knead in additional water by the teaspoon. If it's sticky, slowly knead in more glutinous rice flour. Divide the dough in half, then divide each half into thirds. You should have 6 pieces of dough. Make 3 balls with each piece of dough by breaking off a piece of dough and rolling it in your palms. You should have 18 smooth balls by the end. Bring a large pot of water to boil. Gently drop the balls into the pot. Give it a gentle stir to prevent them from sticking to the bottom of the pot. Cook for 6-8 minutes, until all the tang yuan dango are floating and slightly swelled up. In the meantime, prepare a large bowl with ice and water. When the tang yuan dango are done cooking, use a slotted spoon and immediately transfer them into the bowl of ice and water. Allow to cool for 20 seconds, then drain well. Put 3 dango onto each skewer. Top with roasted black sesame seeds, freeze-dried strawberries, and maple syrup. Serve immediately. Alternatively, you can keep the dango at room temperature for a few hours. Add on a bit of maple syrup first (to prevent the dango from sticking to one another and to the plate), and top with the sesame seeds, freeze-dried strawberries, and additional maple syrup just prior to serving. Due to the fine texture of glutinous rice flour and the careful balance needed between the liquid ingredients and dry ingredients, this recipe benefits from being measured by weight (grams) as opposed to volume (cups). 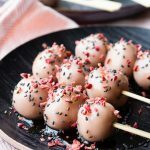 You can also use the strawberry syrup recipe from this Vegan Strawberry Milk if you want to make these tang yuan dango without refined sugars. You will only need half of the strawberry syrup recipe. Recipe for the sticky rice balls adapted from the sticky rice wrappers from Lady and Pups Peanut Butter Sticky Rice Balls in Green Tea. Get this recipe for Strawberry Tang Yuan Dango at https://www.theworktop.com/breakfast-brunch-recipes/strawberry-tang-yuan-dango/.